Despite the commonality of these birds, I love to watch them. Well, I love to watch anything and everything when I’m out & about in nature, honestly — they’re all bright gems to me. I recently watched and photographed a Harvest Mouse for a good 15 minutes…. The Common Grackle (Quiscalus quiscula) is a large blackbird that’s often confused with the American Crow. 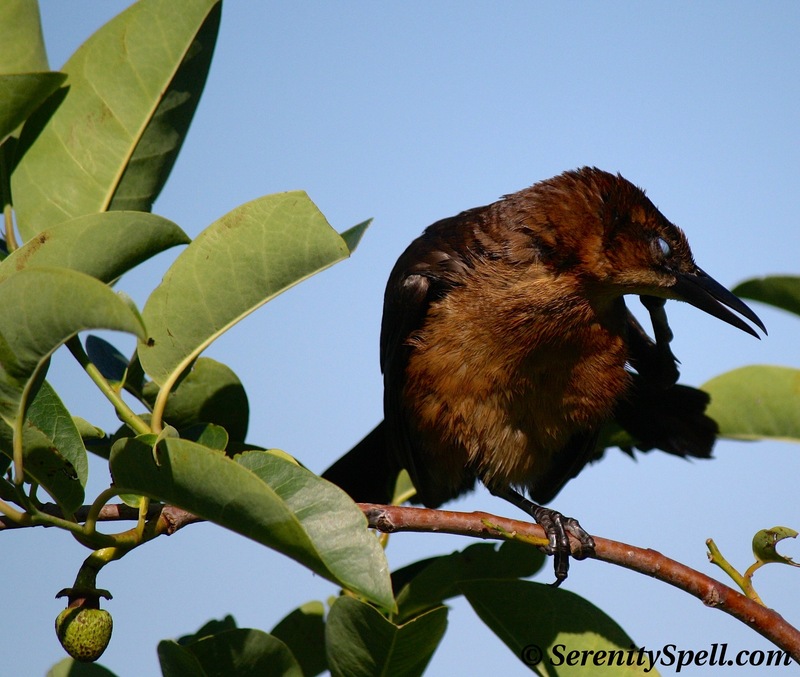 Adult males are iridescent black, with long dark bills, long tails, and pale yellowish eyes. Females are slightly smaller and less glossy — brownish, in fact. 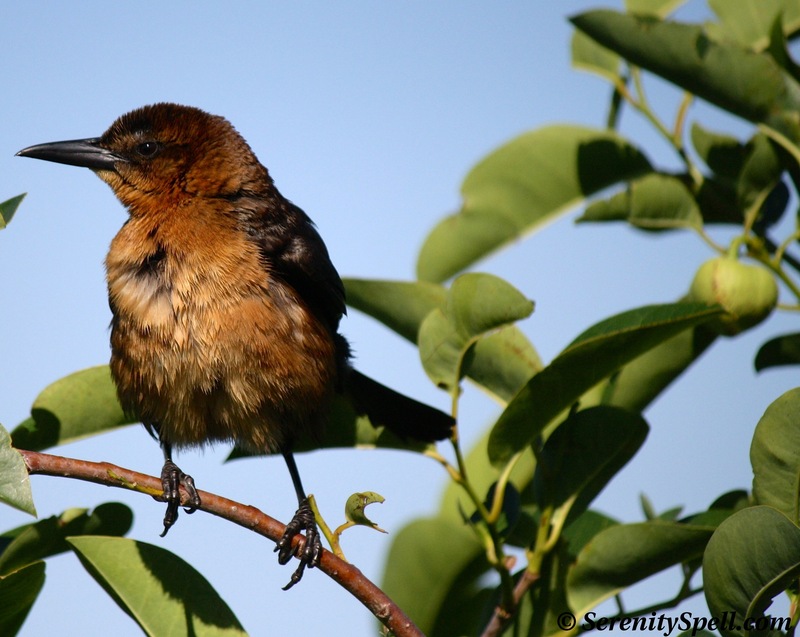 Their song is a bit harsh, especially when it’s calm in our protected wetlands and several birds suddenly appear. They’re found across North America east of the Rocky Mountains, being permanent residents in much of this area. As forests were cleared for farmland, their range expanded west. 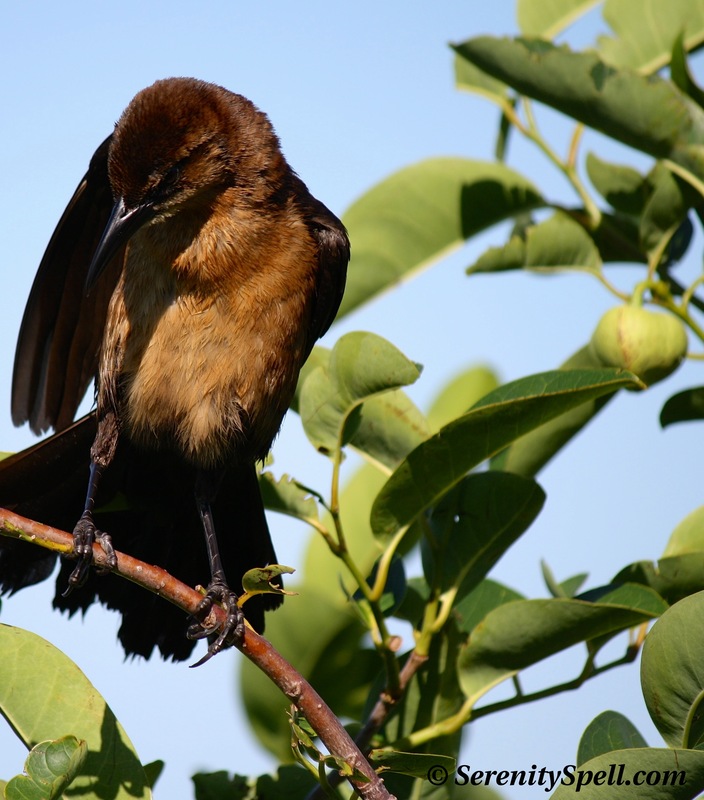 Grackles nest in colonies, hiding their nests in dense trees and shrubs, often near water. These birds forage on the ground, in shallow water, or in shrubs — I’ve seen some interesting scenes of them skimming our wetlands’ duckweed in rapid flight for long periods of time…and I recently caught some photos of such an event. They’re omnivorous, and will steal food from other birds. I caught this girl resting in a pond-apple tree, a common fixture in our wetlands, marshes, and the Everglades; they’re also known as Alligator-apple (for the fact that alligators will eat the fruit), Swamp-apple, Corkwood, Bobwood, and Monkey-apple. 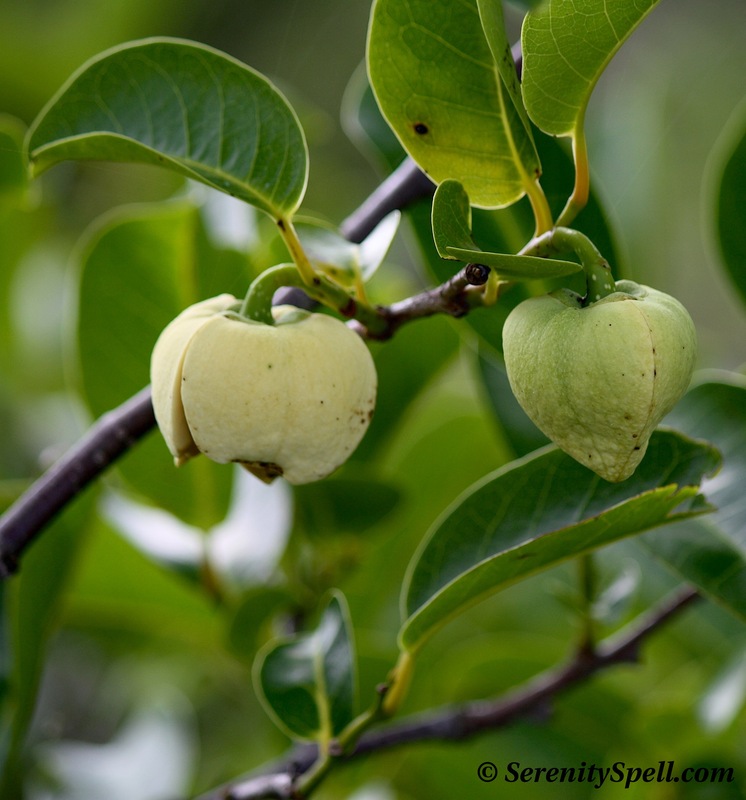 Unable to grow in dry soil and tolerant of saltwater, pond-apples are native to Florida, as well as the Caribbean, Central and South America, and West Africa. The tree averages 30-35 feet in height, and its blossoms are lovely creamy white and pale yellow, almost tulip-shaped. The fruit is apple-sized and mango-shaped, and falls when it’s green or ripening yellow. Edible to humans (it can be made into jam), the fruit serves as food for many species. It can be a bit bitter or tasteless for us, however (although its flesh is quite fragrant) — as my guy can attest to when I demanded he try it (“let’s make jam out of it!”). 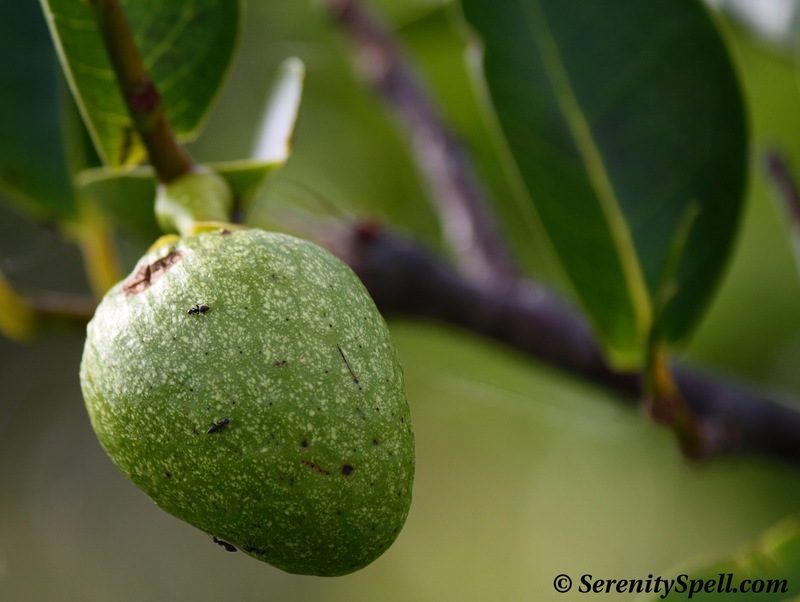 Pond-apple trees have become a scourge overseas, but in the Everglades they’re a valuable source of sustenance for our wildlife — I’ve seen alligator, raccoon, and all species of turtles munching on fallen pond apples. The trees provide shelter for myriad creatures, and their canopies are used as nesting grounds for all species of birds. Even more interesting, recent studies have shown that its alcoholic seed extract may provide anticancer compounds that could be used pharmaceutically. Grackles are one of my favorite birds. I put out food for them, and keep my bird bath full so that I can watch them throughout my day. Thanks for posting! Ditto!! It’s hard not to love them, all of them… ♥ It took me a bit to figure out what the females were, despite seeing them *constantly* in our wetlands!! GASP…. Oh, I would have spent *far more* than 25 minutes on playing foxes!! They’re some of my favorite all-time animals, oh gasp. You’re so lucky!! 🙂 Glad you enjoyed the pond-apple (swamp-apple) info — it really is a fascinating (and totally integral) tree. I wish I could have…but it got dusky. They are still coming back and today I will try to get some better shots. It was such a blast. They were not much bigger than an adult cat. Red fox! Their mom saw our cat trying to stalk them, and he was very sorry. She didn’t hurt him, but he will not be doing it again. I loved the way they pounced in the field very acrobatic! 🙂 I will share if I can get better shots! Such absolutely gorgeous pictures!!! Thank you so much and keep up the good work!!! and leave plenty of droppings on cars, sidewalks, and other things below them. As you pointed out, they can often be seen foraging on the ground, including supermarket parking lots where they look for dropped bits of food. Wow, that’s truly a Hitchcockian shot if I ever saw one! We don’t seem to get quite those numbers in our swamp areas and wetlands — perhaps the gators keep their populations down, heh. In Austin the grackles definitely aren’t threatened by gators—and luckily neither are nature photographers. 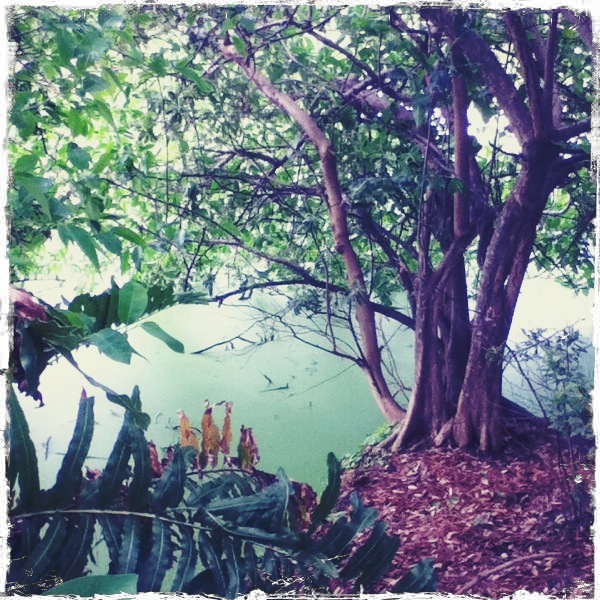 Hi there….I have a small pond Apple tree growing in my yard. I actually just recently figured out what it was. Did you ever make jam out of the fruit? Ah,that’s great you have a pond apple — all the songbirds seem to love them! I was actually going to research how to MAKE the jam, but never did. I hope you get to do it… From what I hear, you may need lots of sugar, or stevia preferably.